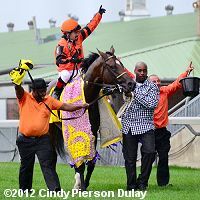 Jockey Justin Stein celebrates after winning the Queen's Plate aboard Strait of Dover. 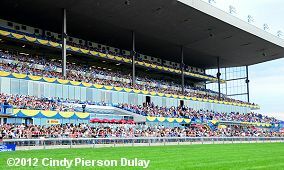 On Sunday June 24, a maximum field of 17 Canadian-foaled 3-year-olds raced 1 1/4 miles over the Polytrack at Woodbine in the 153rd running of the $1 million Queen's Plate Stakes, the oldest continuously-run stakes race in North America and the first leg of the Canadian Triple Crown. Unfortunately, due to the current political situation in Ontario, many believe this will be the last Queen's Plate to be run. 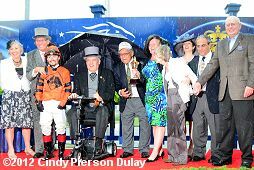 It was a damp afternoon, with dark overcast skies, intermittent showers, temperatures in the mid 70's, but a brief downpour coincided with the winner's circle ceremonies. A field of 14 went to post, with Plate Trial winner River Rush sent off as the lukewarm 7-2 favorite. 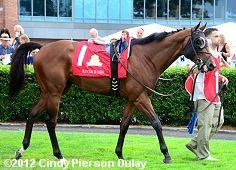 In to challenge him included 38-10 second choice Strait of Dover, winner of three straight including the Marine last out, and 4-1 third choice Golden Ridge, off his maiden win. Down the stretch with Strait of Dover holding off Irish Mission. Exiting the chute, jockey Justin Stein sent Strait of Dover to the lead and he set fractions of 23.85, 47.74, and 1:12.31 over the fast Polytrack while pressed by 22-1 Colleen's Sailor and stalked by 19-1 Macho Whiskey and 25-1 Classic Bryce. Entering the stretch, Stein loosened the reins allowing Strait of Dover to extend his lead to 2 1/2 lengths through 1 mile in 1:37.07. Irish Mission, 7th early, and 6-1 Dixie Strike, last early, put in strong late rallies but Strait of Dover was well clear, finishing up 1 1/4 lengths in front of Irish Mission in a new track record time of 2:01.99. It was another 3 3/4 lengths back to Dixie Strike third. The time was just 0.19 seconds off Izvestia's 1990 record set over the old dirt surface. 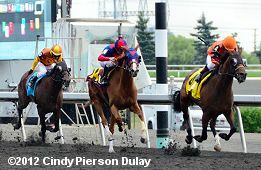 Check out the five other stakes on the card: the King Edward (G2) won by Riding the River, the Highlander Stakes (G2) won by Smokey Fire, the Singspiel Stakes (G3) won by Musketier, the My Dear Stakes won by Just Got In, and the Trillium Stakes won by Stars to Shine. Left: Strait of Dover in the winner's circle with owners Wally and Terry Leong. 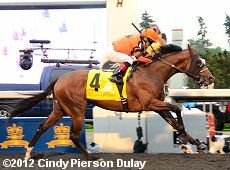 He is the first British Columbia-bred winner of the Queen's Plate, a homebred of the Leong family's Canyon Farms in Kelowna, by English Channel out of the Danzig mare Bahrain Star. 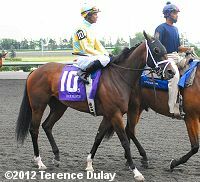 He failed to perform on the 5 furlong dirt track at Hastings so he was sent to Woodbine to run on the Polytrack or the turf. Terry Leong said, "Danny talked us into it. He said we had a chance. If we didn't have chance, if it was another 50-1 shot, we wouldn't have entered. The credit goes to Danny and Justin for the ride. We saw that Dan was wonderful with young horses and that's how we got here." Wally Leong added, "When Danny got him, he said this could be a nice horse. When he won his first race last November, he said to me, I'm not letting this horse out of my sight." Right: The Honourable David C. Onley, Lieutenant Governor of Ontario, presents the trophy to the connections of Queen's Plate winner Strait of Dover. 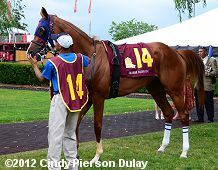 Left: Strait of Dover in the paddock before the race with jockey Justin Stein behind him. Right: Strait of Dover in the post parade. Trainer Dan Vella said, "Good horses do good things. We all like to take a little credit but truthfully he's a great horse and that's what it's really about, the people that bred such a great horse and just being associated and being able to train these types of horses. It's what us guys in this industry, that's what we want to do. Well, we talked about it with Justin and we analyzed the race and we thought it was a possibility we would end up on the front end. We really didn't want that. You're doing the work for everyone else, but if you're there, you're there." Left: Strait of Dover leads first time by. Jockey Justin Stein said, "I loved this horse all along. He's shown me and I have said it time and time again that he is a racehorse. He wants to get out here and he wants to win. He calmed right down as soon as he saw that we were going into the gate and he just stood there and waited for his turn to be loaded. That's what he wants to do. I didn't have to be on the lead with him today but no one else wanted to go and we were going pretty easy so I just let him roll on up there. I have faith in this horse and he just galloped around there like a champ." Right: Justin Stein tosses flowers to celebrate aboard Strait of Dover. Stein added, "The boys in the jocks' room said would I trade my goatee for this win and I said I would, but I don't know. I might have to fight them off! It has been a tremendous year for Vancouver. It was sort of like fate, almost like it was meant to be. The stars have aligned, right. Gutierrez winning the Derby and the Preakness and my horse coming into the Plate the way he did. Dominant. And, of course, we got the Vancouver rain in Toronto." 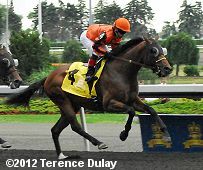 Stein is a native of Vancouver and, like Mario Gutierrez, started his career at Hastings Park. 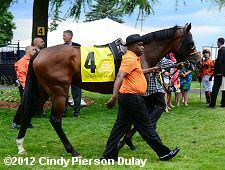 Left: Second place finisher Irish Mission in the paddock before the race. Her jockey Alex Solis said, "The other horse is a very nice horse. Every time I would get close to him he had another gear. It was a great race. It took a track record to beat it. I know my filly. She always keeps coming. She galloped strong down the stretch but the other horse was a little stronger today. To be honest, I did get the trip I wanted. 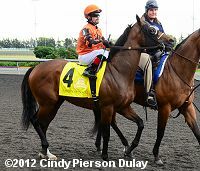 I know a lot of people were concerned with the 14-hole, but she is such a big filly with a big stride. I was actually happy to have number 14 where I can get her in the rhythm and that's what I did." Right: Third place finisher Dixie Strike in the post parade. 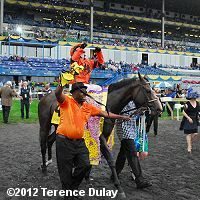 Her jockey Patrick Husbands said, "We had a good trip. She was relaxed, but the way the race unfolded I had to wait and wait and the winner got away from me. He had the first run on me. I was wide and had to wait." Left: Sixth place finisher and beaten favorite River Rush in the paddock before the race. The 7-2 favorite ducked in at the start, settled near the back of the field 8 1/2 lengths back saving ground under jockey Jim McAleney, was shuffled back on the backstretch and failed to rally, finishing 6th beaten 10 1/4 lengths. The Reade Baker trainee has a record of 1 win, 1 second, and 0 thirds in 4 starts, earning $113,886 for owner-breeder Frank Stronach (Adena Springs). Right: The crown in the stands just before the start of the Queen's Plate.